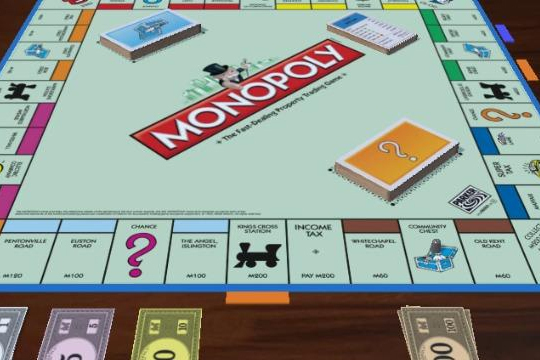 The board game Monopoly® was originally invented by Elizabeth Magie, under the name "The Landlord's Game", as a means of demonstrating the evils of rentier capitalism. Originally, there were two sets of rules - essentially, socialism (where the rewards for development were shared by all) and capitalism (where the rewards accrue to the monopolist, who crushes all opponents) - the purpose being to show the moral superiority of the first set. Naturally, because the world is like that, the first set of rules languishes in the dustbin of history, nestling snugly alongside the Sinclair C5, the TV soap Eldorado, the Edstone, scrunchies, one-nation conservatism, Borat's mankini (thankfully), my hair (sadly) and Trotskyism (ironically, since it was Trotsky who coined the phrase "dustbin of history"). The second set was a massive hit - later developed into the board game we now know, with the help of Quakers, still with moral aims in mind. In its moral aim, it failed utterly. Instead it became the most popular board game in the world and a reliable source of rent to its owners. Anyone who has played the game (which is everyone, right?) knows that it quickly and unerringly draws out and amplifies our most avaricious and competitive tendencies, even among those in whose mouths, in normal circumstances, butter would not melt. Monopoly, like many games, reveals us in our true colours. But there are other lessons too, that can be revealing about the real world. This note is an extended thought-experiment: Monopoly as a model to help us think about the impact of liquidity. First, what's the impact of an increase in liquidity in the banking system? In Monopoly, this would equate to increasing the stock of notes at the bank, not by withdrawing them from circulation but by - say - taking currency from a second or even a third set. What effect would that have? The obvious answer is: none - because, unless that additional liquidity were to enter circulation among the players, it can't make any difference to the game. 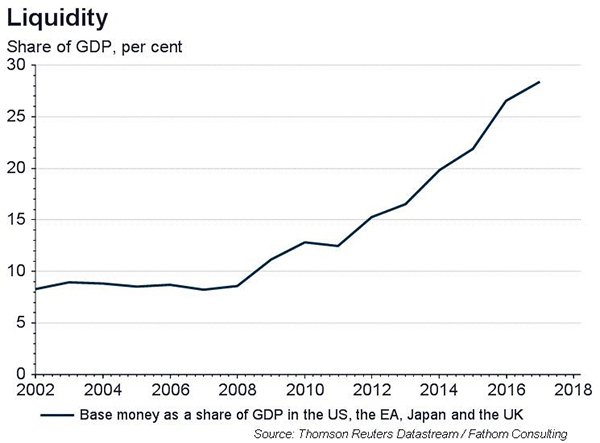 There is an analogy with QE here - if the additional liquidity just sits in the banking sector, what difference does it make to the real economy? But there are circumstances in which the liquidity of the bank runs out - when there are many players and when the game goes on for a long time. I've played games that evolved in this way. The consequence is, when you pass 'Go' you don't collect £200, nor do any of the prizes in Chance or Community Chest pay; and you can neither sell your houses nor mortgage your property back to the bank. Then the pressures on each player's financial position that arise from their interactions with the other players become significantly more important. Typically, the game is over soon after the bank runs out of money. The real-world analogy would be a credit-crunch in the banking sector (so no new 'lending' to the private sector, such as occurred in 2008/09) combined with a fiscal tightening (withdrawal of 'Go' money, and the prize cards), attributable again to a drying up of credit, this time to the public sector - and the impact (profoundly recessionary) that would have on the real economy. Spending falls; people go bankrupt. Bringing in (printing) new liquidity would alleviate these problems, and the game would go on for longer. Second, what would happen if a larger proportion of banking sector liquidity entered circulation (analogous to an increase in the ratio of broad to high-powered money in the real world)? For example, contrary to the strict rules, most games I've played involve getting double the normal 'Go' money if you land on 'Go' - and depositing all fines into a big pot in the middle of the board that's gleefully taken by whoever lands on 'Free Parking'. These two measures substantially increase the notes in circulation during the game. The typical result: the game lasts longer; players become more risk-loving; hotels go up everywhere (so rents increase); all properties get bought; and the secondary market price of properties in the game increases. The additional money in circulation boosts activity, bids up asset prices and rent, and keeps people in the game longer. I've even played games in which once an hour or so, every remaining player is gifted £500 by the bank, in addition to the 'fiscal transfers' above. Those games can continue indefinitely: there comes a point where the rent, even on Mayfair with a hotel, is trivial by comparison with the money balances of the players. You just go round and round, transferring arbitrarily large pots of money between one another. There's no strategy that will win, and you'd have to be exceptionally unlucky to lose. The game ends when the bank runs out of money, if it ever does. If there are few enough players, and all the money is in circulation, then there's an equilibrium in which the game never ends. I've played in games like that - you eventually give up out of boredom. The only part that's fun is while many players are reduced to few. There's no single winner - but there are losers, and, of course, the process of identifying the losers is fun. For the winners. Third, what if bank liquidity is artificially restricted? I've played those games too, with ancient sets where half the money has been lost over the years. Then the cash constraint bites hard, and early. In those games, it's possible to win with only the stations and the utilities - properties that don't permit development. Some properties remain permanently unsold; while many are permanently undeveloped. It's a much lower-welfare equilibrium: few houses; no hotels; The Angel Islington a dirty, unsold or mortgaged backwater. These games function as games; they play out in a reasonably short space of time. But somehow you feel that this isn't how the game should play. It should be more fun. There should be a feeling of wealth and opulence, at least for some; not just grinding poverty for all. Fourth, what if additional liquidity is brought in from outside the game? I've played in games where certain players (who shall remain nameless) have imported money, up their sleeves, from other sets. This is known as 'cheating'. The real-world corollary might be money laundering or passing off counterfeit money - or, conceivably, introducing an alternative currency like Bitcoin. The macro effect is to bid up asset prices; but the micro effect is to redistribute resources towards the cheats - so long as they go undiscovered. Cheats, if undetected, prosper - in Monopoly as in life (though of course the damage they inflict on their own souls is without price and irreparable). Fifth, the alternative currency effect has a closer parallel, which is effectively an exchange rate between Monopoly money and real-world goods and services while the game is underway. For example, I've played in games where individual players have been 'paid' (in Monopoly money) to make a round of tea in the real world. Or to stoke the fire. Or to change the music. This brings something in from outside the game that affects outcomes in the game - alternative currencies are a bit like that. Finally, where cash liquidity is tight, other forms of liquidity sometimes take its place. I've played in games where one player judges it not in her interests to force a second player out of the game, because doing so would release properties of interest to a third player. So, instead of insisting on receiving rent when the second player lands on her property, she extends a loan to the second player, attracting an interest rate that compounds every time the second player passes 'Go'. Equally, the third player can intervene and offer a loan on more favourable terms. Access to credit makes the game last longer. But liquidity, as we know, isn't the same as solvency. You may be flush with cash, but if you owe all of that and more to someone else - if you are 'fundamentally' bankrupt - then it's just a matter of time before it's game over. As a note of caution, when a loan in Monopoly is finally called in, the effects on personal relationships in the real world can be devastating. The key respect in which Monopoly is unlike life is that the bank in Monopoly has no objective. It's passive - it just does what the players agree it should do. It's the perfect agent, with no interests of its own to pursue. Imagine if there were a banker in the game, and the banker got paid. Imagine if the banker's pay increased when the bank had extended lots of loans: either secured loans (mortgages) or unsecured loans (agreements to pay back the principal plus interest). Imagine if the banker were also one of the players, able to buy, sell and develop property like the others. Imagine, in fact, if every player were also a banker. What then, eh? What a game that would be!